Now this is a very curious project – www.raisethecloud.org. If I read things correctly, it would appear that the plan is to raise some kind of high-level art work/monument/construction for people to visit, above London for 2012. It connects to digital media somehow and apparently the size will depend on the donations they receive from around the world. It would appear that they plan to crowdsource a large number of small donations. Once built, visitors will contribute to the energy harvesting project simply by walking up to the top. Looks very high for a bubbly, transparent, and above all flexible looking structure. I’d quite like to know more about the digital media aspect, its not clear what that is all about from the website. All sounds very ambitious but interesting none-the-less. When you read about virtual worlds like Second Life or World of Warcraft, you tend to think of the stereotypical geek in front of the computer. You don’t usually associate them with the likes of the Royal Opera House, London. However, in November 2009, as part of their ‘Firsts 2009‘ series, they staged a mixed reality performance consisting of musicians on-stage at the Royal Opera House, and other performers as ‘avatars’ within the virtual world of Second Life. Looks like it was an interesting experiment. The work was entitled ‘The Second Death of Caspar Helendale‘, and looks to be the brain-child of the composer and artist Jessica Curry, a classically trained composer working with digital art, virtual worlds and composition. Shame I missed it – I would have liked to have seen that. How Many Notes in Mozart’s Requiem? When some bright spark suggests a ‘how many notes in the score’ competition, I thought what piece could be better than Mozart’s Requiem? 4 choral parts, orchestra, I could have the vocal score on hand for reference and estimating, etc, etc. One problem – just how many notes are then in Mozart’s Requiem? Well, when Google failed me, and I counted how many notes in one bar of the score (more than 40), I decided extrapolating from a sample of bars to the whole piece was impractical, I thought I’d look for help of a more technical kind. Googling eventually found me a site with the complete Requiem as a series of MIDI files. Great – thought I’d just load them into a sequencer and that would do the job. But no, the sequencer’s I have and tried didn’t have a ‘total notes’ statistic anywhere that I could find. Well, this is the point where the geek takes over … MIDI is just a series of instructions ‘turn this note on, turn this note off, change to violin here’ and so on. So, armed with the MIDI files, I just have to find something that would count the ‘note on’ events in each track in each file. Well, after a bit of playing around, and looking for help, I found the MIDI perl library. This enabled the following script (stored here in case someone else has the same whimsical, insane idea and needs to do something similar). 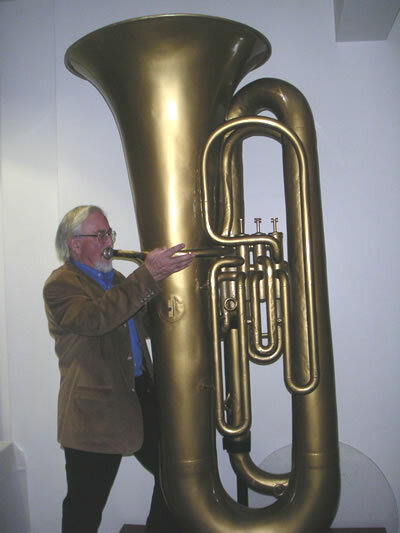 How about this for a tuba … 34 feet of tubing! It does play, but unfortunately the valves don’t work. Still, quite an amazing instrument!